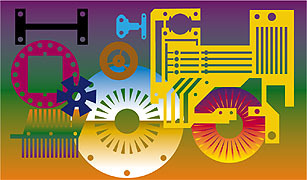 Materials and Limitations — International Etching, Inc.
What materials can be specified? Almost all alloys and metals are etchable. Etching baths at International Etching, Inc. are set for processing all copper, brass, cold-rolled steel, stainless, nickel, silver, molybdenum, and electronic alloys, as well as, many custom composites and inlays. What are some of the size limitations that photo-chemical machining can produce? Considerable variation in size is achievable ranging from etched thicknesses of .0005” to .060”. Parts like elevator panels, .250” thick by 60” in length can be chemically milled with etched down characters or Braille (raised). Widths exceeding 24” require custom processing. Please ask.